The peaceful monks of Harmony Island are in trouble. It seems that zombie pirates have descended upon the island and stolen the monks' brains, turning them into zombies themselves! Can you return peace and tranquility to the island before it's too late? Begin by speaking to Brother Tranquility in Mos Le'Harmless. Enter Port Phasmatys, and let Bill Teach bring you to Mos'Le Harmless. As soon as you step off the ship, you'll see Brother Tranquility waiting for you, just outside the docks. Talk to him, and he'll tell you about a problem on the island he lives on, called Harmony. Agree to help him, and you'll be teleported to Harmony Island, with a magic spell this time, instead of a quick knock on the head by a bottle like you've experienced when going to Braindeath Island. As soon as you arrive there, you'll notice something certainly isn't right, some of the monks are zombie-ish! Brother Tranquility will ask you to find out what the zombie pirates are up to, and tell you that they're led by a character that goes by the name of Mi-Gor, and he'll send you out of the windmill. Beware of the Level 57 (yet unaggressive) Zombie Pirates, as they'll attack you as soon as you step out of the windmill. They aren't too much of a threat, but they can be a nuisance. 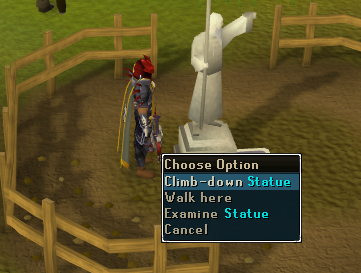 Go north of the windmill to find the statue of Saradomin that stands just north of the allotment patch. Make sure you're wearing your Diving Helmet and your Diving Apparatus. If you've lost them, just talk to Murphy, the sailor in Port Khazard, to get them back. Climb down the hole and descend the stairs to enter the watery section below the Monastery. 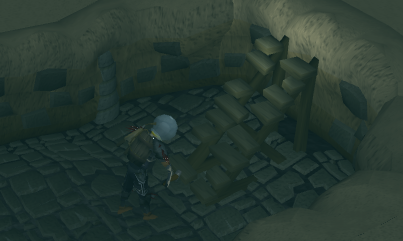 Run past the Zombie Pirates until you see some stairs that need repairing. Repair them with 4 Normal Planks, and 10 Nails (bring some extra ones, as you're likely to bend a few; remember, you're going to bend more if you're using Iron or Bronze nails than if you use Adamant or Rune Nails) along with a hammer, and climb up to the monastery, in a small room that is secluded from the rest of the monastery. Peer through the peephole in the room, and you'll overhear that Mi-Gor will be "down below" for a while, and he'll ask about how the gas production on the island is going on. One of the Sorebones will say that there are some problems slowing down its production, but that the plan will continue as planned. You'll also hear about something called "The Box" which scares the Sorebones from the mere mention of it. Head back to Brother Tranquility and tell him about everything you've learned from your small bit of spying. He'll mention an ancient prayer book, which can be used to protect the user from poisons and gases, and he'll tell you that you can find it in the Edgeville Monastery. The book is located in a bookcase in the southwest corner of the Monastery. Read it afterwards. You'll need 50 Prayer Points to read the book out loud on the island, so recharge your Prayer Points in the altar upstairs before you return. You will need a Blessed Holy Symbol to recite the prayer. Go back to Brother Tranquility, who will ask you if you said 'the words' before reading it; you'll, of course ask "What words?" because Brother Tranquility forgot to tell you. Oh well, after all, do you expect a semi-zombified creature to remember everything? 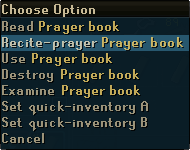 Get teleported to Harmony Island, and right click on the book to recite the prayer, because the sleeping gas is already starting to come in. After you recite the prayer, don't go out without your Diving Helmet and your Diving Apparatus on. Otherwise you'll fall asleep from the gas (it's called sleeping gas for a reason!) and the monks will have to save you. Then speak to Brother Tranquility again and you'll have to decide what to do next, you'll need to get Doctor Fenkenstrain there to bring the monks' brains into the right bodies. Yuck. How can you convince him? Well, just tell him that there's a werewolf-free island for him... easy, isn't it? Head to Fenkenstrain's Castle a bit west of Port Phasmatys and go to the tower where Doctor Fenkenstrain is staying and tell him about Brother Tranquility's proposal, as you may expect, he'll accept the offer. The only problem is, he's a bit reluctant about the use of teleporting (he claims he's allergic to it), and the werewolves have a good sense of smell - they would recognize him if he were to walk outside of the castle. So he tells you about Rufus' meat shipments, and he could smuggle himself inside one of the crates they use to transport the meat. Head to Canifis, which is just a short walk southwest of the castle and talk to Rufus, the owner of the meat store there. Talk to Rufus, the owner of the meat store (it's just north of the bank) in Canifis with your Ring of Charos equipped about how you're planning to ship some meat, and he'll be suspicious of the shipment that you'll be sending as you never mention what kind of meat you're going to be shipping. Rufus will eventually come to the conclusion that you'll be sending cats... err... yes, of course, cats! That's what we were thinking all along, weren't we? 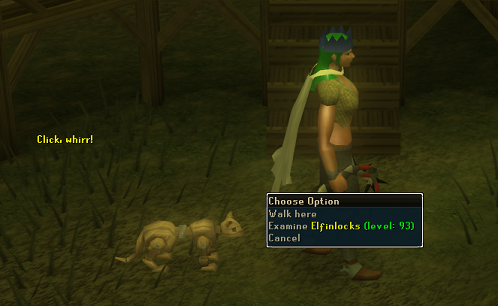 As soon as you step outside of the shop, there will be a short cutscene with Elfinlocks from the Draynor Bank Robbery and her fake, wooden cat. Also, you'll get a wondrous idea, instead of live cats, you'll make some fake ones! You'll need 1 fur and 1 plank for each fake cat (you'll need to make 10 total) and you can make them at any Player Owned House, on a Clockmaker's Bench. If you need furs, you can buy them in Varrock Square or in Ardougne Market. Make ten fake cats, then bring at least 28 nails (20 for the Crate, 8 for the false bottom. And if you're using Iron or Bronze nails; bring some extras, as you're likely to bend some. ), 4 normal Planks, and the crate pieces, and make the crate on the building spot right by Doctor Fenkenstrain, adding the false bottom shortly after. Fill the crate with the fake cats you've made, and talk to the Doctor again. He'll tell you he's ready, so blow your wolf whistle. There will be a cutscene in which you trick Rufus into thinking that the cats are alive and well apart from being slightly scared (actually, they're stiff as wood) and he'll agree to ship the crate. 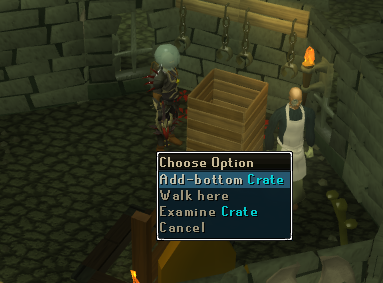 After the cutscene is over, use the shipping order with the crate, and the crate will be teleported to its destination. Oops, wasn't the Doctor allergic to teleporting? Let's hope the reaction isn't too serious. Head back to Harmony Island by talking to Brother Tranquility, who will tell you that your poor cats were stolen by some pirates, but that the Doctor is still alive and well. He'll also tell you that the passage you used earlier can no longer be used because the zombies found out and closed it. Visit the Doctor down in the windmill. He'll ask for some rather... unusual objects such as a cranial clamp , a pair of brain tongs , three bell jars , at least thirty skull staples , and a hammer. It looks like there's a ship around, so the plan is: get some gunpowder, and then blow up the front door of the monastery. Where would we ever get without explosions? Run to the northernmost part of the island, and enter the ship. Climb the ladder, pick up the tinderbox if you don't have one already, and pick up a keg from beside the cannons. Climb back down the ladder, open the locker and pick up the fuse inside. Use the keg and the fuse with the door of the monastery, and then use your tinderbox with the fuse... BOOM! So how are we going to get a new door? Walk into the monastery, and kill some of the Sorebones. You only need to kill four, and you'll get the items you need (one will drop the cranial clamp, one the brain tongs, one the bell jars, and one the skull staples). Then head back to the Doctor. He'll take your items, then he'll ask you to help with the... operation. 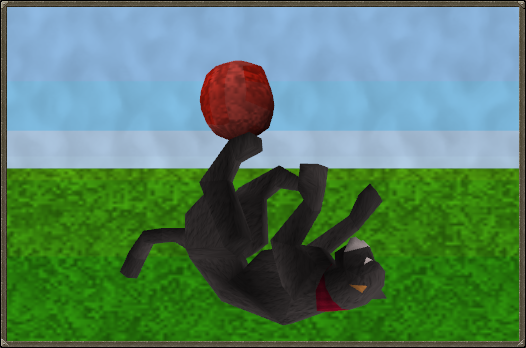 What would've been a terribly bloody and graphic scene ensues - but the kind folks at Jagex replaced it with a picture of a kitten. Haven't we had enough of the cats already? After the cut scene, head back upstairs and talk to the monks. Brother Tranquility will tell you that the battle against Mi-Gor's bodyguard will be fierce, so be prepared. You can't use prayer, so be aware of this; let him teleport you to the island to resupply. Go inside the monastery when you're ready, and confront Mi-Gor. Barrelchest is level 72, can hit up to 300, and his weapon acts like a halberd if you try and run away or attempt to safespot him. Poison works, and he drains and disables prayer with every hit, so you have no chance of using prayer or safespotting. Although Barrelchest is an easy opponent to defeat (since the Evolution of Combat update, anyway), it would be wise to bring a few pieces of food and a teleport option (such as an Ectophial) just in case. Once you have defeated Barrelchest, pick up his anchor, and talk to Brother Tranquility. He'll ask you what happened, and he'll question you about a noise, like... locusts. Oops. Barrelchest Anchor - A two-handed weapon; crushing attack; picture below. Blessed Lamp - gives 5,000 experience in a skill of your choice. Prayer Book - cures poison when you recite the prayer. 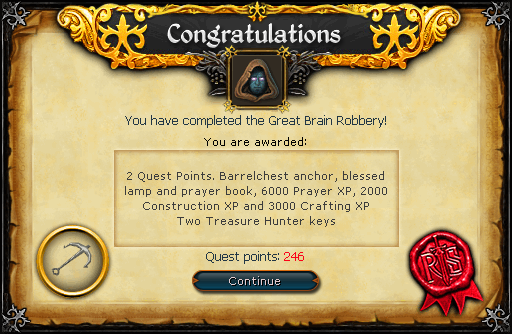 6,000 Prayer experience 3,000 Crafting experience 2,000 Construction experience Use of the allotment patch in front of the monastery Bard Roberts in Port Sarim's pub will sing you a shanty of the adventures you had on this quest. To fix the anchor, ask Smith on the Mos Le'Harmless dock, and he'll fix it for a price tag of 230,000gp. It's a two-handed weapon, with medium speed and high strength. The Barrelchest anchor has a Special Attack called "Sunder", which doubles your chance to hit. 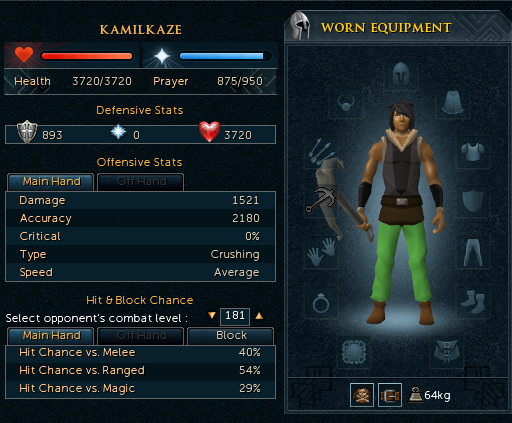 A successful hit will lower either your enemy's Defence, Attack, Ranged or Magic level by 10% of the damage caused. You can recite from the book when you are wearing a Holy Symbol. If you are poisoned, you will be cured when you recite from the book. It drains one prayer point. Your prayer doesn't get drained when you recite the prayer if you're not poisoned. You cannot cure poison by reciting the prayer if your Prayer is 0. [^] Climb down the statue with your diving gear equipped. [^] Climb down stairs and head past the zombies. [^] Fix the stairs then climb them. [^] Peer through peep hole. [^] Talk to Brother Tranquility in the windmill. 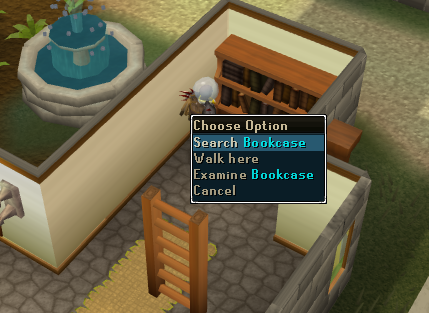 [^] Search the Southwestern most bookcase. [^] Recite the prayer from the book in the windmill. [^] Talk with Brother Tranquility again. [^] Go to Fenkenstrain's Castle and speak to him. [^] Go to Canifis and talk to Rufus with a Ring of Charos on. [^] Tell Rufus you're shipping cats. [^] Go to a POH and make 10 fake cats. [^] Build the fake crate and bottom. [^] Use the cats with the crate and talk to Dr. Fenkenstrain. [^] Blow your wolf whistle. [^] Use the shipping order with the crate. [^] Talk to Dr. Fenkenstrain on Harmony Island. [^] Head to the ship and climb the ladder and pick up a keg. [^] Go back down the ladder and search the locker for a fuse. [^] Use the keg and fuse on the monastery door. [^] Use the tinderbox on the fuse. [^] Kill Sorebones in the monastery for the required items. [^] Talk to Dr. Fenkenstrain. [^] Talk to the monks after the cut scene. [^] Go inside the monastery and defeat the Barrelchest. [^] Take the anchor and talk to Brother Tranquility.